Orion Chem is manufacturer of Calix arene in india, with state of art manufacturing facilites in MIDC Tarapur, Maharashtra, India , our utmost attention is given to generate quality products meeting stringent and demanding specifications of user industries. Calix arene is synthesized by aluminium trichloride catalyzed de-butylation of p-tert-butyl calix arene. Various functional groups and chain lengths are appended on the lower rim of calix arene to get desired cavity size on the molecules. Calix arene, therefore, serves as a starting material for derivatives used in complexation and separation of lanthanides and actinide from nuclear waste. Calix  arene acts as a surfactant in coupling reactions in pharmaceutical synthesis. As well polyhydroxamine derivatives of Calix arene display anti-tumor activity. 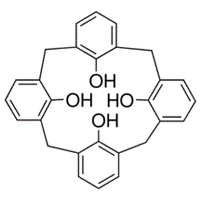 Application It acts as a surfactant in coupling reactions in pharmaceutical synthesis. As well polyhydroxamine derivatives of Calix arene display anti-tumor activity.